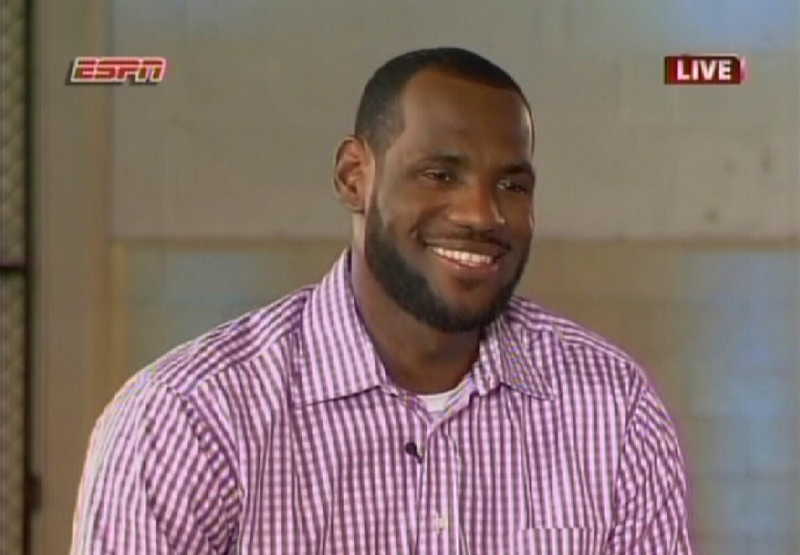 Thu., July 8, 2010, 6:32 p.m.
LeBron James wanted to play with Dwyane Wade and Chris Bosh. The only place that could happen was Miami. Get ready, NBA: A superstar trio is born. Ending weeks of silence and drama, the two-time MVP said on his ESPN special from Greenwich, Conn. on Thursday night that he’s decided to join the Miami Heat and leave the Cleveland Cavaliers after an unsuccessful seven-year quest for the championship he covets. This time, it’ll be about a gold trophy, the NBA championship one — the one Wade got in 2006, the one that James and Bosh have yet to touch. It’s a huge victory for the Heat, who got commitments from Wade and Bosh on Wednesday. That duo, along with James, formed the upper echelon of the most-celebrated free-agent period in league history. Heat president Pat Riley landed them all, a three-pack of stars to help shape his quest for a dynasty in Miami. And for Cleveland, a city scorned for generations by some of sports’ biggest letdowns, James’ long-awaited words represented a defeat perhaps unlike any other. James is gone. Home sweet home no more. He said he made the decision Thursday morning and knows it won’t go over well in Ohio. His new home — part-time or otherwise — wasted no time in beginning the celebration. Horns honked outside the arena and on Miami Beach, where Wade was watching the announcement with members of his inner circle. “It’s going to be crazy,” Wade said. “I’ll believe it when I see it,” Louisville coach Rick Pitino said while attending a tournament of high school stars at Cleveland State University, co-sponsored by James and Nike, one of the 25-year-old’s corporate partners. This wasn’t about money, though. Wade and Bosh both said they would take fewer dollars to make this happen. And that, combined with what Riley and Heat coach Erik Spoelstra said to James on the recruiting tour, was enough to pull off the stunner. Because they have overspent while trying to please James and win the first title by any of Cleveland’s three pro sports teams since 1964, the Cavs are strapped with a few big contracts that have eaten up salary-cap space and prevented them from making roster moves to improve the team. With the possible exception of Los Angeles Lakers superstar Kobe Bryant, James is the NBA’s premier player, but his legacy cannot be fulfilled until he wins a championship. If it’s going to happen soon, it’ll happen in Miami. Published: July 8, 2010, 6:32 p.m.